I happily admit that writing is my favorite subject to teach. Unfortunately it is often the least favorite time of day for many students. I find this so discouraging, because I love to write and I really want my students to enjoy it too! That is why one of my missions in life is to find ways to make students like writing! We are currently writing personal narratives in third grade. My students start the year with many skills already in place. They have learned the basic conventions of writing and they can write a story with a beginning, middle and ending. The most common missing link in their writing seems to be adding enough detail to make their story clear and interesting for the reader. In other words, they tell the beginning, middle and ending...but pretty much that's it! So we spend a lot of time learning strategies for adding details. Too often teachers tell their students that they "need more details" but neglect to give solid lessons on "how" to do that. Students tend to equate "more details" to just "more". Then you get stories that just ramble on endlessly without much focus on the topic or "heart" of the story. The common core has given us some guidelines to help students to add meaningful detail to their writing through the language that they have used in the standards. Writing standard 3 for third grade states that students use dialogue and descriptions of actions, thoughts, and feelings to develop experiences and events or show the response of characters to situations. This is a great start to helping students to add the right details to their writing. Too often you see students choosing topics that are way too large and encompassing. Topics like "My Trip to Disney" are so large that students can only tell about the events and not many details. These types of stories turn into boring retellings of what happened first, next, next, next, then, then....and on and on! You know what I'm talking about....these are torturous to read! LOL! Teaching students how to choose tiny moment topics will lead to stories that can be enriched with lots and lots of juicy details. Instead of "My Trip to Disney", a better topic might be "Taking Off On Space Mountain", which lends itself to a great story filled with wonderful and exciting details about riding the dark and scary rollercoaster! 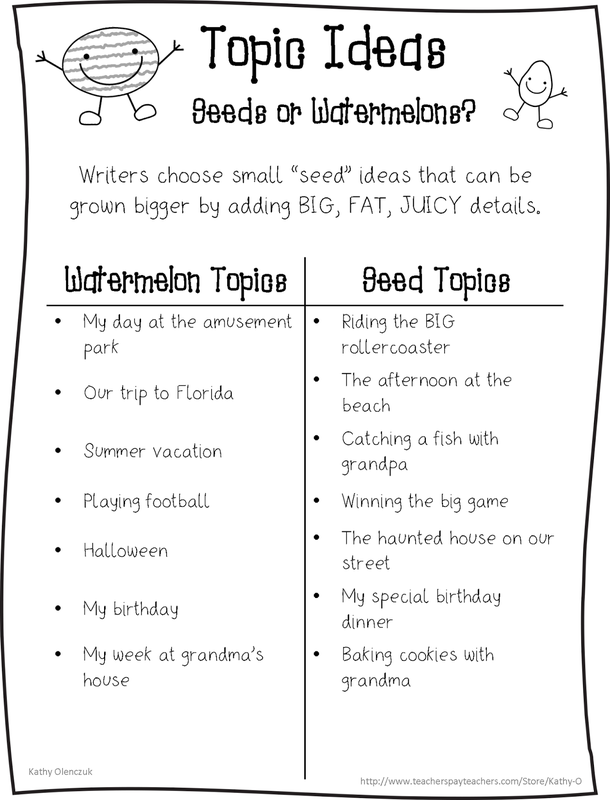 Here's a little FREEBIE to help your students choose seed ideas (It is 2 pages from my new mini-unit on Descriptive Writing. During reader's workshop, we are always getting students to think about the "author's message" or the heart of the story. What lesson did we learn from the book? When we ask students to write their own personal narratives, we often neglect to ask them to include an author's message. Without this component, their stories often lack focus and direction. When planning their story (I love using a story mountain), students should begin with a seed topic that also has a lesson or message to be learned. They should reflect on why the story is important to them and what will others learn from their story. I like to call it "the heart" of their story. They can then place focus on the most important part or parts of their story and add details to the parts of the story that highlight the message they want to convey. Third graders are often shocked when I tell them that they will write and re-write their stories several times before they are done with it. Coming from first and second grade they haven't quite grasped the idea behind the writing process yet. They think that editing and revision are basically the same thing. They reality is that the details and descriptions in a story often get added on during the revision stage of writing. First draft writing is quick and dirty.....it tells the story without too much detail. I have students write many "first draft" narratives before they have to pick one that they'd like to revise. It is during this revision stage that I spend several lessons teaching strategies for adding more details to their writing. They then go back into that story they picked and "try out" each strategy by adding details here and there to make their story better. They are always pleasantly surprised by the great changes they see in their story after they have revised by adding more detail. -Adding sensory details to help the reader experience the story with all five senses. -Telling the internal story: What were the characters thinking and feeling? -Describing the action in the story. -Repeating a word to emphasize and idea or action. -Include a detailed description...of a person, place or thing. When students are given the tools they need to improve their writing...they start to enjoy it more! They know what to do and they really get into it. If have put together a mini-unit on Detailed and Descriptive Writing, which includes lessons on these strategies and more. I would love to give it away to a few of my followers! If you are interested, in the comment section below please leave your email address and share a little writing tip that you think we might find helpful in our writing instruction. I will choose at least three "winners". Thank you for stopping by today....I hope you have a wonderful week! Kathy, Like you, I love teaching writing! Your synthesis of the key craft moves to support 3rd graders is spot on! Your posters are graphically simple and clear. 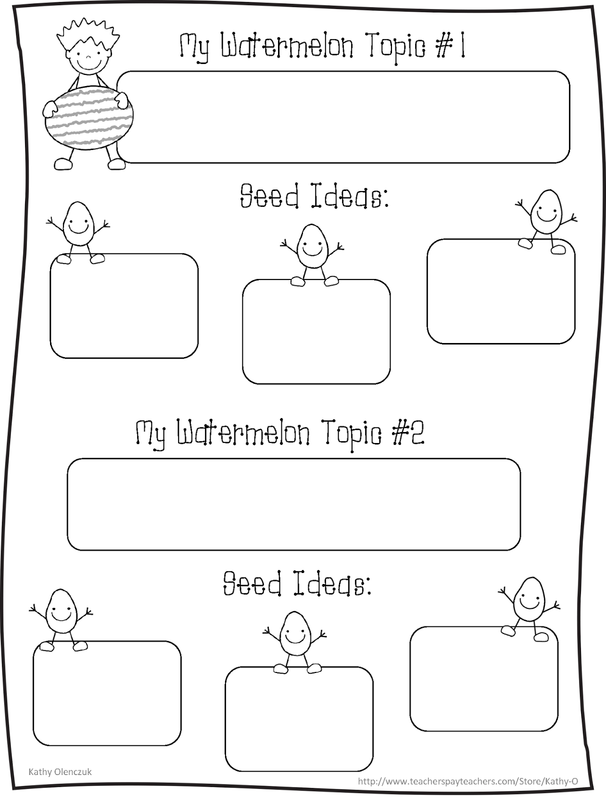 Thanks for offering a new way to use the idea of watermelon vs. seed idea for generation of ideas. To describe action I find it helps students to think what happened just before the action and just after the action. I use cueing arrows to help. In this way students can string together 3 teeny tiny actions and increase their elaboration of the action or outside story. Thanks! Suzy Q I am sending you the Descriptive Writing pack. Yearn to Learn....I wish I had your email address cause I would send it to you too!